Rivers State University, Nkpolu-Oroworukwo, Port Harcourt, Nigeria. The woman with the issue of blood as reported in the Holy Bible suffered in her condition for 12years before she was healed by Jesus Christ. This review aims at underpinning the condition to haematology, identifying the probable causes and its diagnosis. Based on the signs and symptoms associated with her condition, menorrhagia, a condition characterized with prolonged menstrual bleeding is the probable clinical condition she suffered. Low level of von Willebrand factor, other clotting factors and disorders in platelet functions can all be implicated in menorrhagia. Laboratory diagnosis can be achieved by testing the levels of the clotting factors and investigation of platelet function. The woman with the issue of blood as recorded in the Holy Bible was diseased with an issue of blood twelve years (Matthew 9:20). She probably had suffered a lot in the hands of many physicians and had spent all that she had, but could not get her condition better of, instead it rather grew worse (Mark 5: 26). She had heard of Jesus Christ and when she saw He was near she joined in the throng of people following Him as He made His way to Jarius’ house. She said within her, “If I may but touch his garment, I shall be whole.” (Matthew 9: 21). She came behind Him and touched the hem of His garment (Matthew 9:20). As soon as she touched Him “the fountain of her blood was dried up” and she “felt in her body that she was healed of that plague” (Mark 5: 29). 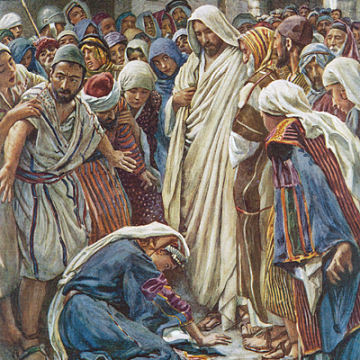 As soon as she touched Him, Jesus Christ immediately knowing in himself that virtue had gone out of him (Mark 5:30) stopped and asked “Who touched me?” Everyone around Him denied it and Peter asked him “Master, the multitudes throng thee and press thee and sayest thou, who touched me?” (Luke 8: 45). When the woman saw that she was unable to hide from the Lord she came trembling and falling down before him, she declared unto him before all the people for what cause she had touched him, and how she was healed immediately (Luke 8: 47). Christ looked on her and told her, “Daughter be of good comfort: thy faith hath made thee whole; go in peace” (Luke 8:48). things he would have to wash his clothes and bathe in water to become clean again. Also during this time if any man was sexually intimate with her he was also unclean for 7days and must adhere to the same sort of “setting apart” as a woman (and actually the guidelines for a man who has an issue of blood, or who was unclean were more strict than for women, Leviticus 15:1-30). The Mosaic law also specified that if a woman had an issue of blood that lasted longer than 7days that all the days of her issue were considered unclean and she must be treated as such (Leviticus 15: 25). This means that this woman had probably been unclean for 12years and that she had to live “put apart” from others for all that time. If she had been married her husband probably would have divorced her as she would have been unable to care for her children or for others without making them all unclean. Her unclean status would also have meant that she was probably unable to attend the temple or other worship services. One of the probable causes of the issue of blood could be “prolonged menstruation” and today this woman probably would have been diagnosed with menorrhagia, which is an abnormally heavy and long menstruation that causes enough cramping and blood loss, such that it makes normal daily activities impossible. It may also be right in calling it a “hemorrhage” because the amount of blood lost is significant, such that it is enough to fill a maxi pad at least every hour for several weeks (not to mention 12 years!). In the Holy Bible, it was reported that the woman spent all of her living upon Clinicians who could not help her solve her problem. Today, Clinicians are usually able to treat or control menorrhagia with hormone pills but in severe cases hysterectomy (removal of the uterus) and endometrial ablation or resection (which permanently destroys the entire lining of the uterus) are used to treat it. It is incredible that Jesus Christ was able to heal this woman with only by her touching the hem of His garment! Abnormal menstrual bleeding in adolescents can be caused by a number of conditions: the most common cause is immaturity of the hypothalamic pituitary ovarian axis, bleeding disorders are another. Assessment of each case with thorough history, physical examination, and laboratory investigations are crucial in reaching the diagnosis. Once a proper diagnosis is made, counselling of the patient and her parents is necessary, follow up and long term therapy in some cases is required (Gillani and Mohammad, 2012). Phillip et al., 2005, reported an incidence of abnormal platelet aggregation in 45% of women with bleeding disorder. In our study 3 patients (8.6%) had idiopathic thrombocytopenic purpura. Acute idiopathic thrombocytopenic purpura is most commonly seen in the young and is immunological, caused by immune complex containing viral antigens that bind to platelet Fc receptors or by antibodies produced against viral antigens that cross react with platelets. The majority of studies in the West report von Willebrand disease as the most common inherited bleeding disorder leading to menorrhagia whereas studies in South East Asia have found platelet function disorders as the leading inherited bleeding disorder in women with menorrhagia. Endocrine disorders can cause anovulation producing an environment of unopposed oestrogen. In the absence of progesterone, the endometrium eventually breaks down causing menorrhagia (Foster, 1995). The menorrhagia associated with hypothyroidism responds to thyroid replacement therapy in doses sufficient to correct the other manifestations of the condition. Menorrhagia is a common clinical problem, reported by 5–10% of women of reproductive age (Vessey et al, 1992). The investigation of menorrhagia has traditionally focused on the organic pathology of the uterus itself (Oehler and Rees, 2003). Women with menorrhagia frequently undergo intensive investigation, yet in approximately 50% of cases, the cause may not be identi?ed (Oehler & Rees, 2003). However, in the past decade, studies in women with a normal gynaecological examination have shown that a sizable proportion may have an underlying haemostatic defect. In a systematic review of 11 studies involving 988 women, the overall prevalence of von Willebrand disease (vWD) has been reported to be 13% (Shankar et al, 2004). Additionally, an estimated 50% of women presenting with menorrhagia could have a platelet function disorder (PFD) (Philipp et al, 2003). The reported prevalence of von Willebrand’s disease (vWD) is increased in women with menorrhagia, with current estimates ranging from 5% to 20%. The consistent results of multiple studies suggests that testing for von Willebrand’s factor level should be included in the evaluation of patients with menorrhagia, especially in unexplained cases and prior to any surgical intervention. Although a cyclic variation in von Willebrand’s factor levels has not yet been confirmed, several studies suggest lower levels during menses and the early follicular phase. Menorrhagia is one of the most common bleeding manifestations of von Willebrand’s disease, as reported by 60–95% of women afflicted with this bleeding disorder. Menorrhagia is typically severe, often resulting in anemia and interfering with quality of life. Despite the frequency of menorrhagia, there is no consensus on optimal management. Although oral contraceptives are frequently prescribed, there are no studies confirming their efficacy using objective measures of response. Desmopressin was associated with an 80–92% response rate in several uncontrolled studies relying on patient assessment of efficacy. However, a small, randomized trial found no significant reduction in menstrual blood flow compared with a placebo. There are anecdotal reports of the successful use of antifibrinolytic agents alone and in combination with other therapies. There are no studies comparing the relative efficacy and safety of the available medical therapies for von Willebrand’s disease associated menorrhagia. Until these studies are completed, treatment should be individualized based on von Willebrand’s disease subtype, patient age, contraceptive needs, and personal preference (Kujovic, 2005). Haemostatic testing can be performed on specimens collected during the first 4days of the menstrual cycle, based on demonstration of a statistically signi?cant decrease in von Willebrand factor (VWF) levels during that time (Miller et al., 2002). Other laboratory testing should include coagulation factors level and clot screens (prothrombin time, activated partial thromboplastin time, thrombin time, euglobulin clot lysis time, factors II, V, VII, VIII, IX, X, XI, and XIII) as described (Dilley et al, 2001; Miller et al, 2003) and ?brinolytic factors like plasminogen activator inhibitor (PAI)-1 activity and alpha-2-antiplasmin. In patients with severe bleeding associated with haemodynamic changes, blood transfusions are indicated with administration of intravenous conjugated equine oestrogen, 25 mg I/V every 4 hours for up to 24hours. Bleeding usually decreases within 24 hours and then oral oestrogen can be substituted, progesterone is also usually added. In Polycystic ovarian disease, ovaries typically have multiple follicular cysts less than 10mm in size and increased stroma. It is associated with chronic anovulation and hyper androgenism. The primary menstrual irregularity in these patients is oligomenorrhoea, although about 5% may demonstrate polymenorrhoea. This may be temporary in adolescents or may eventually progress to advanced polycystic ovarian disease. Diagnosis is confirmed with altered cycle day-2 luteinizing hormone and follicle stimulating hormone ratio. These patients are given prescribed hormonal pills (Gillani and Mohammad, 2012). Foster, P.A. (1995). The reproductive health of women with von willebrand disease Unresponsive to DDAVD: result of an international survey. On behalf of the subcommittee on von willebrand factor of the scientific and standardization committee of ISTH Thromb. Haemostat, 74, 784-90. Gillani, S. & Mohammad, S. (2012) Puberty Menorrhagia Causes and Treatment. Journal of Medical Science (Peshawar, Print), 20(1): 15-18. Kujovich, J. L. (2005) von Willebrand’s Disease and Menorrhagia: Prevalence, Diagnosis, and Management. American Journal of Haematology, 79, 220–228. Miller, C.H., Haff, E., Platt, S.J., Rawlins, P., Drews, C.D., Dilley, A.B. & Evatt, B. (2003) Measurement of von Willebrand factor activity: relative effects of ABO blood type and race. Journal of Thrombosis and Haemostasis, 1, 2191–2197. Oehler, M.K. & Rees, M.C. (2003) Menorrhagia: an update. Acta Obstetricia et Gynecologica Scandinavica, 82, 405–422. Philipp, C.S., Dilley, A., Miller, C.H., Evatt, B., Baranwal, A., Schwartz, R., Bachmann, G. & Saidi, P. (2003) Platelet functional defects in women with unexplained menorrhagia. Journal of Thrombosis and Haemostasis, 1, 477–484. Phillipp, C. S., Faiz, A., Dowling, N., Dilley, A. & Micheals, L.A. (2005) Age and prevalence of bleeding disorders in women with menorrhagia. Obstetric gynaecology, 105, 61-68. Shankar, M., Lee, C.A., Sabin, C.A., Economides, D.L. & Kadir, R.A. (2004) von Willebrand disease in women with menorrhagia: a systematic review. British Journal of Obstetrics and Gynaecology, 111, 734–740. Vessey, M.P., Villard-Mackintosh, L., McPherson, K., Coulter, A. & Yeates, D. (1992) The epidemiology of hysterectomy: Findings in a large cohort study. British Journal of Obstetrics and Gynaecology, 99, 402–407.